If you think of car adverts of the 20th century, one manufacturer jumps out at you. That being Volkswagen and their print adverts for the Beetle. 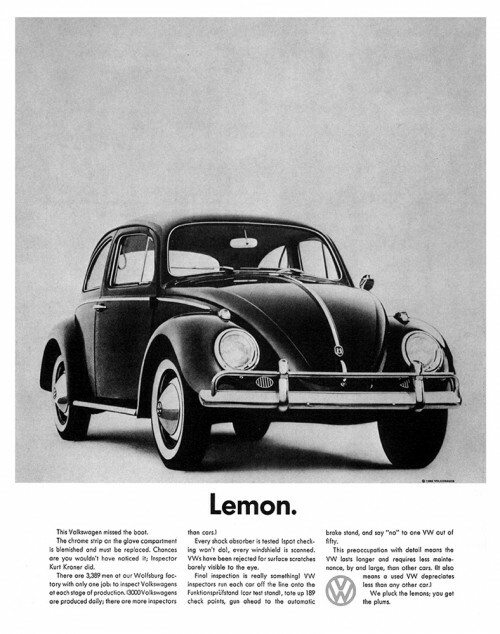 In 1959, Volkswagen approached various advertising agencies to pitch for the account. A company called Doyle Dane Bernbach (DDB) finally won the account. They still have the account 55 years later. The company had a small budget to work with, $800,000, but they used it wisely. Keeping the adverts simple. Just using black and white. Not touching up the images as much as other agencies could. Then they got the coup de grâce. Humour. Sometimes taking a dig at the company and the product. This gained them many awards. These included the best advertising campaign of the 20th century with the “Think Small” series of adverts. Even today, the spirit of the early adverts are still with us. Just look at a VW advert and you will see it. Lots of white and, normally, a single image simply used. Not only that, the advert style has been used in parody. Probably best know is its use in the National Lampoon. 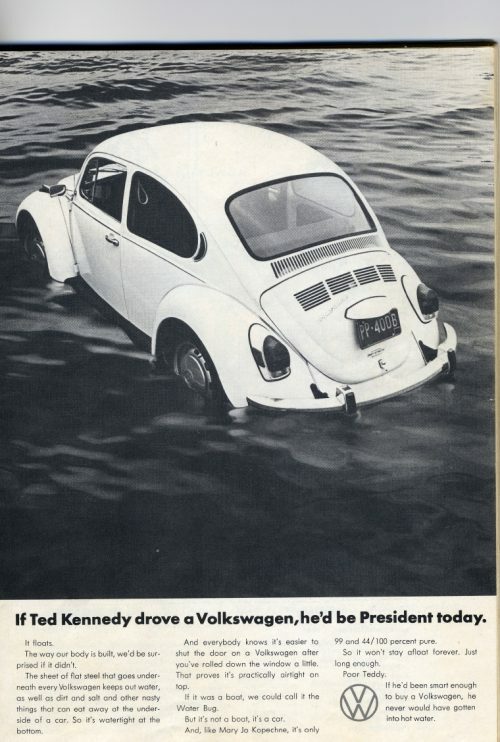 Making fun of the drowning death of Mary Jo Kopechne. Bad taste I know but very nicely done. The ads don’t care if they are sexist, self-depreciating or not even showing the product! Yes, some ads didn’t even have a shot of what they are selling on them. Why do you need to. The Beetle changed so slowly over the years that you could have used any year’s model and the public wouldn’t have known the difference! This approach also went into the television adverts. Even up to the last time the Beetle rolled off the production line in 2003. They are funny, simple and just stick in your head. The Spanish at the end of the above adverts say, or is based on, “Es increíble que un auto tan pequeño deje un vacío tan grande. Adiós Sedán.“. In English it translates as “It was incredible that such a small a car leaves such a large emptiness. Goodbye Beetle“. Sedán is one of the nicknames of the Beetle in Mexico.